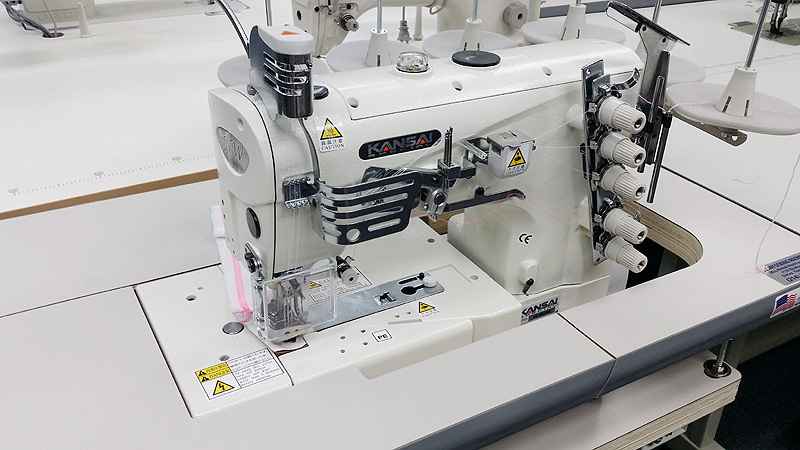 The very latest model - KANSAI SPECIAL NW-8803GMG - is a three-needle top and bottom flat bed covesrtitch sewing machine designed to sew such items as athletic uniforms, men's and ladies underwear, t-shirts and other apparel made of knit, lycra, polyester and stretchy fabrics. This machine is the GMG subclass - which means MULTI GAGE. The machine comes with 2 sets of hardware - for standard coverstitch seaming AND a separate set for binding. The machine comes set-up with 3 needles for top and bottom cover stitching, however, you can remove the middle needle and sew two rows up top and cover on the bottom. This KANSAI model comes from the industry leader in chain stitch and coverstitch machines and is the world-standard in quality and function. Made in JAPAN.